I was soooo excited when I found this candy recipe in Grandma's cookbook! She used to make these once in a while for me when I went to visit. She didn't make them often, but when she did, I loved helping her dip the little berries in red sugar to make them glisten. Thanks for the berries, Grandma! 1. Blend milk, coconut, pecans, Jello and salt in a food processor. 2. Cover with cellophane and chill for 1 hour. 3. Remove from refrigerator and shape into strawberries. 4. 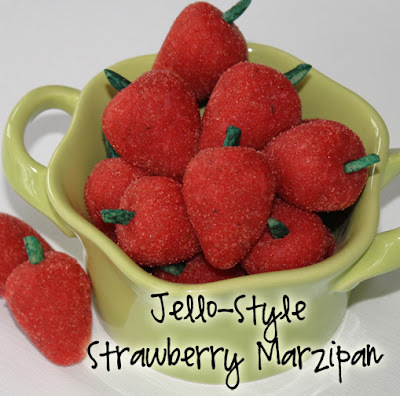 Roll strawberries in leftover Jello. 6. Shake almonds and a few drops of food coloring in a Ziplock. 7. Place one almond in each strawberry for stem. Keep refrigerated. Can be frozen. 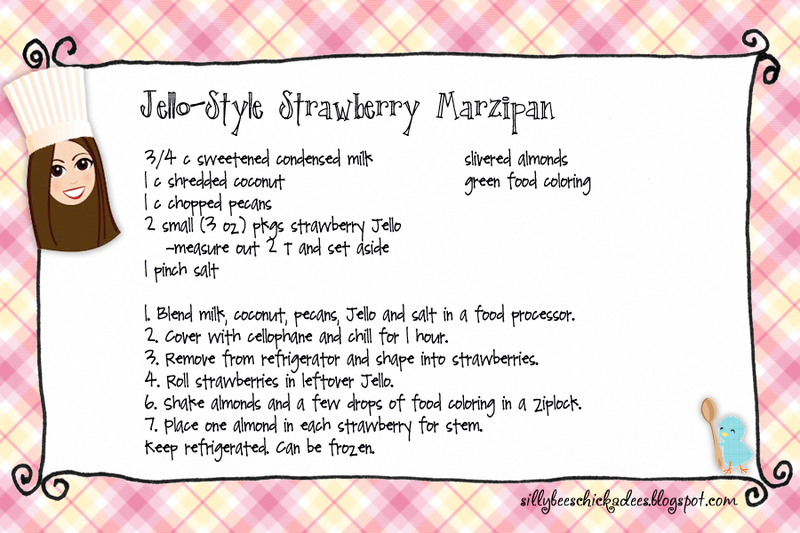 Click on the recipe card below to print out your very own! OMG! My husband will seriously flip his lid for these!!!! Thanks Grandma!!! These look so sweet! I love making things like this! They are delicious and very addictive! Ahhhh! I knew there was something I forgot to add to the post! I highly suggest that you eat at least one batch prior to sharing. I understand that 10s of dozens of people around the globe lose their amazingly-delicious-too-beautiful-to-eat-but-I-will-anyway tastebuds which cause them to be immune to such delicacies and just may faint at the mere aroma of these delights. Please proceed with caution. It's your charge as a responsible baker to protect your family's tastebuds from amazingly-delicious-too-beautiful-to-eat-but-I-will-anyway food items. Thank you. We make these EVERY year at Christmas. Except, we roll ours in colored sugars. First we dip the stem end in green sugar, roll the rest in red, then insert the stem. 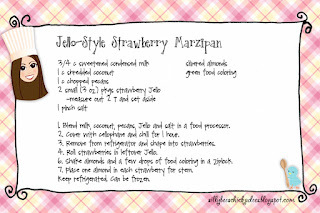 I will have to try them rolled in the Jell-o. Jani- That's how Grandma used to make them. And I haylpt! I prefer rolling them in Jell-o because it makes them prettier and less sticky to handle. These were delicious!!!! And so dang cute! That's hilarious. I'm all about family harmony!